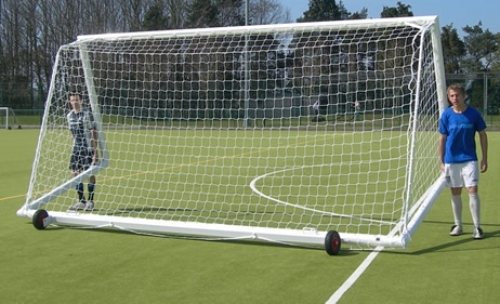 Aluminium FREESTANDING football goal 16' x 6' (4.88m x 1.83m) Top quality and super strong but lightweight aluminium goal, manufactured from 100mm x 107mm eliptical tubing 2.5mm thick with 4 reinforcing extrusions for extra strength. Polyester powder coated white. These goals come complete with 34mm tubular steel net supports, safety net hooks, lifting handles, 4mm tailored nets and steel counter balance backbars with puncture proof wheels.